I always feel nostalgic around Halloween. When I was a kid, it was my favorite holiday, better than Christmas. There was nothing like choosing a flimsy costume with a dangerous plastic mask at Woolworth’s, and waiting with excited expectation for the night I would wear the costume, for that night allowed to run freely through the neighborhood begging for candy. And getting good stuff, too. This was long before the ridiculous concept of “fun size” had flickered in some candy company ad exec’s brain. Real candy bars: Three Musketeers. Hershey’s. Snickers. Milky Way. Sure, there was the random health nut (or child-hater) who would hand out small boxes of raisins, but for the most part Halloween night was a sugar junkie’s nirvana. In fairness to my parents’ nutritional standards, we didn’t get much candy except for those great candy holidays – Easter, Valentine’s Day and, of course, Halloween – so when we did get it, it was a real treat. It must have been on a Halloween night that I learned the principle, “if a little is good, a lot is better”. I remember eating until I felt sick. I don’t remember that the candy lasted me more than a few days. 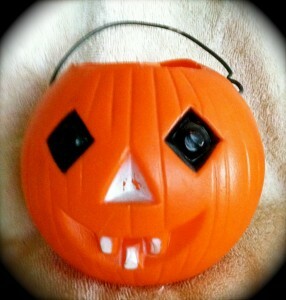 The first time I used this little jack o’ lantern candy holder, I had just turned a year old. Ensuing years of Halloweens saw me graduate to ghost- and pumpkin-festooned felt bags, crayola-decorated paper bags and finally, the teenaged trick-or-treater’s dream, a pillowcase. Ever increasing piles of candy tossed into ever larger bags. I suppose if I hadn’t quit trick-or-treating when I was thirteen, I would now be driving around with a panel truck collecting my share of the Halloween candy. A couple of years ago in the fall, I couldn’t get this elementary school song out of my head. We only sang it during October; it was sung to an appropriately creepy, dirge-like tune. For weeks I hummed, “Tonight is the night when dead leaves fly, like witches on switches across the sky, something something something something moony sheen, It’s Halloween”. One reason I really love the internet, besides its clear utility for wasting vast expanses of time, is that you can look up just about anything and find an answer. It turns out that my Halloween song snippet was part of an actual poem, written by Harry Behn (1898 – 1973) who was a screenwriter in the 1920s and 30s, and a children’s author. I’ll leave you today with Mr. Behn’s complete poem. Some early school lessons really do stay with you. Happy Halloween!